What is payment demand notice? A demand notice is a legal document which is sent by one party to the other party who is liable to fulfill the demand. 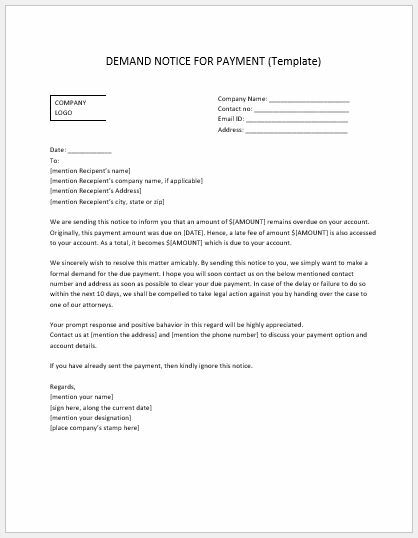 A demand notice for payment is specifically written to demand money. If you want this notice to be valid and legal, make sure that you have included all the basic and important elements in it. When you are not receiving the money that the other party is required to pay, you can write a payment demand notice. This is a notice that serves as a final reminder before you decide to take any legal action. You can send this notice yourself or get the assistance of the lawyer who will send this notice on your behalf on the letterhead of your company. This notice can also be used as a warning notice. Make sure that you have sent many reminder letters before you send this notice. Those letters should be friendly so that you can maintain your business relationship with them. The payment demand notice includes the amount of money which is owed, the reason for payment and the date of invoice. Give the title of the notice at the top so that other party can understand the purpose of that notice. You should know about the consequences of sending this notice. The tone of the notice should be kind and polite. It will not only help you get your money but it will also improve your business relationship. We are sending this notice to inform you that an amount of $[AMOUNT] remains overdue on your account. Originally, this payment amount was due on [DATE]. Hence, a late fee of amount $[AMOUNT] is also accessed to your account. As a total, it becomes $[AMOUNT] which is due to your account. We sincerely wish to resolve this matter amicably. By sending this notice to you, we simply want to make a formal demand for the due payment. I hope you will soon contact us at the below-mentioned contact number and address as soon as possible to clear your payment. In case of the delay or failure to do so within the next 10 days, we shall be compelled to take legal action against you by handing over the case to one of our attorneys. Your prompt response and positive behavior in this regard will be highly appreciated. Contact us at [mention the address] and [mention the phone number] to discuss your payment option and account details. If you have already sent the payment, then kindly ignore this notice.